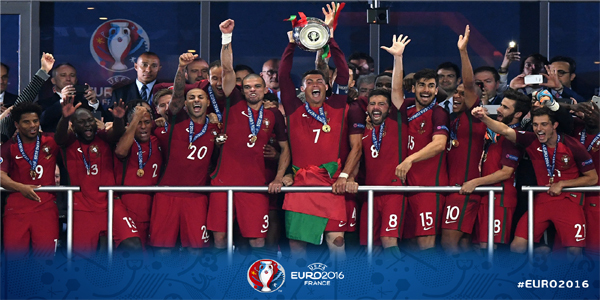 Portugal beat France 1-0 to win Euro Cup 2016. Substitute Eder scored in extra-time to give Portugal a 1-0 win over hosts France in the Euro 2016 final as they secured their first major international title despite losing captain and talisman Cristiano Ronaldo to injury. Eder collected the ball in midfield, held off his marker and fired a low 25-metre shot past Hugo Lloris with 11 minutes of extra time left to stun the Stade de France after the home team had dominated the match. Ronaldo, Portugal's all-time leading scorer, went down after a heavy tackle from Dimitri Payet in the eighth minute but played on before being replaced by Ricardo Quaresma in the 25th minute.